When I first lived in South Africa, Alexandra Township was just down the road, but for a white South African, it could have been on a different planet. The times I went there it was like falling into a time/space gulf. Red streets were either muddy or dusty, tin shacks, living conditions that were unimaginable for those lucky enough to live where white people lived. This is the story of many South African townships as seen through the eyes of white people. Then came the township tour. Starting in the mid-nineties, visitors could see select aspects of township life up close, on foot, accompanied by a resident. 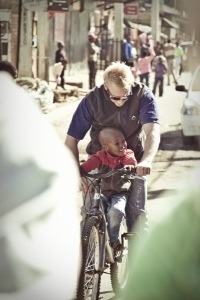 Two years ago, Jeffrey Mulaudzi started conducting tours of Alexandra by bicycle. As he says on his web site, the idea is to create an interest that will not only allow the people living in Alexandra to meet and see the tourists from outside the township, but to also give the community hope, to build their self-esteem and sense of worth. This entry was posted on Wednesday, December 12th, 2012 at 3:00 am	and tagged with Alexandra township, bicycle tours, Jeffry Mulaudzi, township tours and posted in Uncategorized. You can follow any responses to this entry through the RSS 2.0 feed.